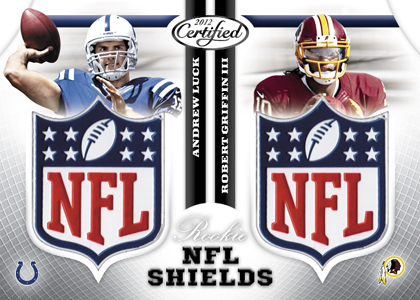 2012 Certified Football looks to both its history and the future. It combines one of the modern hobby's oldest brands with a loaded rookie class. Autographs, memorabilia, multiple levels of parallels and a challenging set structure give 2012 Certified Football broad collector appeal. It's one of those sets that aims to have something for everyone. Hobby boxes come with a four total autograph and memorabilia cards. 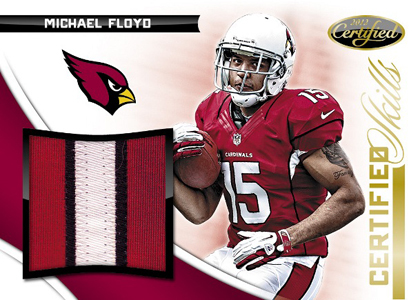 The 350-card 2012 Certified Football set has several levels to it. It begins with 150 veterans. 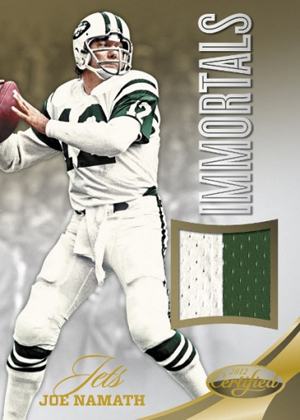 Retired legends are the focus of both Immortals and Immortals Materials. Two rookie subsets round out the set: New Generation (65 cards) and Freshman Fabric autographed memorabilia cards (35 cards, #/499 or less). Immortals and New Generation each fall one per box. Mirror cards parallel the base set. Returning hits include both Certified Skills and Fabric of the Game. 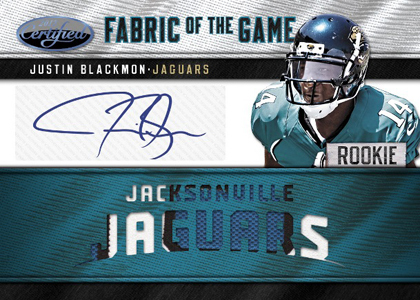 Fabric of the Game cards come with tons of different memorabilia and autograph combinations. Mirror Material inserts come in Gold, Emerald and Black versions. Numbered to 25 or less, each comes with either an autograph or a patch swatch. 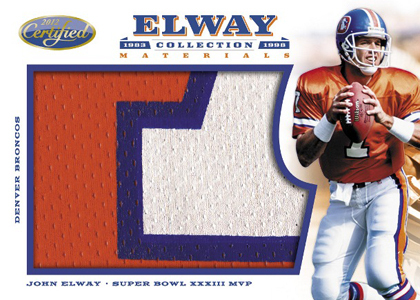 Reaching into the vault, Panini is bringing back the John Elway Collection, which was last seen back in 1999 Rookies and Stars. 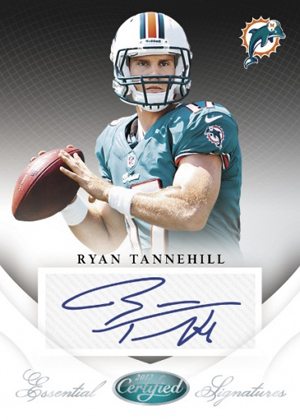 Celebrating the quarterback great, the rare cards include jumbo memorabilia and autographed versions. 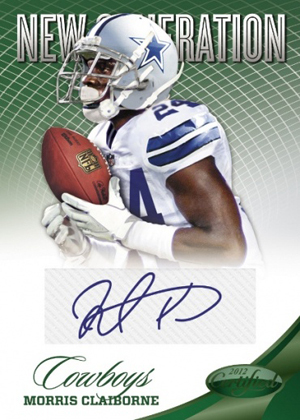 Not resting on the past, 2012 Certified Football introduces Essential Signatures autographs (15 cards) and Rookie Combo NFL Shields. 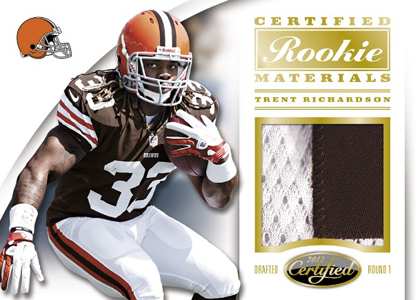 Get a real-time look at the 50 most-watched 2012 Panini Certified Football cards on eBay. wasnt a big fan this year of certified. the product looked really nice, and love some of the rc designs. the box guarantee is a miss, you should get at least a rc rpa of some sort as your auto for the price, as apposed to a 5th rd guy whos a sticker and never sees the field. just think there should be a better hit for such a price and small amount of packs. Beautiful cards that really pop. Also thought the inserts were interesting, not only for their appearance but because of the former players offered. Not a huge fan of Elway, but it kept things interesting for this year. Have enjoyed buying this set and will likely add a few more packs before the end of the year and look forward to next years version. I think this was one of the most underrated products of football this year. The cards are sharp and crisp with a selection from rookies to vets to HOFers. While I do agree with Brad above to an extent, it’s the same issue with many boxes both Panini and Topps. They obviously can’t put the top players in every box. I purchased a box of Inception this year and got nothing better than a 3 rd rounder. Thats where change is needed with cards. You can’t charge the same price for a box of cards with one having RGlll and one having TJ Graham! That is not fair to the buyer. And it seems that because all these rookies were in the rookie photo shoot that they are given the same treatment from card companies. And this is especially true with higher end products like Triple Threads where I saw so much that was not even close to its worth for the price. Charge for what is in the box, not what may be in the box! I know they would never do this as they would never sell the low end players and make a profit. But something needs to change! Four hits per box is a nice way to start. This product has a nice feel to it and I like the extended base list. The Elway set would be a fun chase for collectors of him. Nice release! Didn’t care for the tin foil base card. The lack of rookies is ridiculous for the price an the hits are pretty lousy.The inserts and parallels are ok though. I didn’t get back into the hobby until recently so i’m on the fence about every Panini product especially the brands they took over. Five stars for 2012 Certified! I purchased 2 boxes and these cards are in my top five favorite cards! I come from the old school of thought that less is more, and this product definitely nailed it for me. From rookie cards to the veteran cards, everything was done in exceptional taste! One of my prized items in my collection is a Doug Martin relic, auto, #. The relic on this card spells out the team name! My favorite all time pull from this set is the simple yet stunning Ray Lewis relic card! I hope he goes into the sunset with another Superbowl ring. Brad and Scott, if you want a certain value out of packs just buy the cards you want from ebay. I’m sure you will save a lot of money since cards on eBay sell way below what they are worth. Buying packs are a chance…. Just like buying a scratch ticket. You buy the packs because you want to hit a card you can’t normally aford. Try buying a 1/1 RG3. 2012 Certified Factory Sealed Football Hobby Box 4 HITS Andrew Luck RC ?